Preheat oven to 120°C/250°F. Split and scrape vanilla bean. Add milk, heavy cream, vanilla bean seeds, and the scraped vanilla bean pod to a pot and bring to a boil. Remove vanilla bean pod from the pot. Add egg yolks and some sugar to a bowl and whisk until foamy. Stream in the hot milk and cream mixture while whisking continuously. Set the bowl over a pot of simmering water and heat while whisking constantly for approx. 10 min., or until the mixture thickens. Fill the mixture into ramekins. 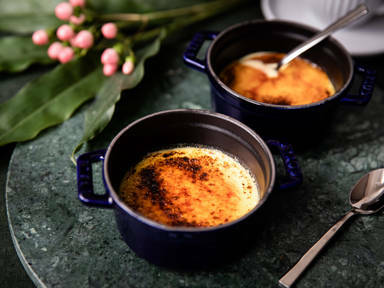 Place ramekins on a deep baking sheet, and pour in approx 1 in./2.5 cm of water around the ramekin dishes. Bake at 120°C/250°F for approx. 35 min. Remove from oven and let cool completely. Sprinkle remaining sugar on top and use a flambé torch to caramelize. Enjoy!